Since the NCAA instituted regionals as a qualifying measure for the NCAA Golf Championships in 1989, only 10 women’s teams have qualified for regional play each year. At least one of those streaks is in danger of ending. 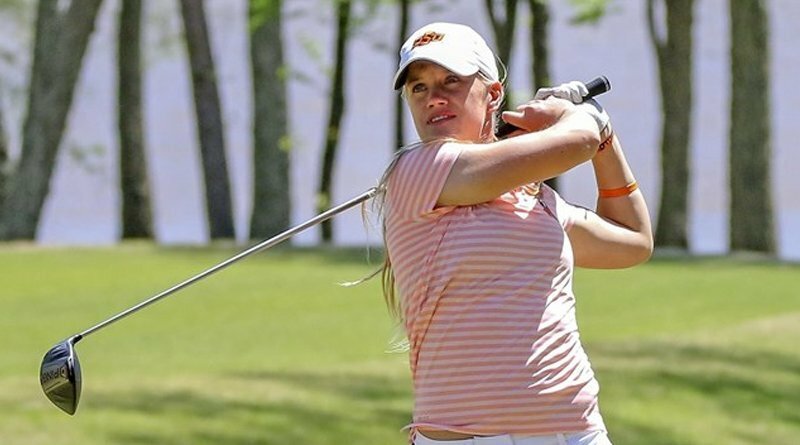 The Oklahoma State women’s team needs a strong finish to the Big 12 Championship at the Golf Club of Oklahoma Tuesday to earn one of the final at-large spots for 2019. There are four regional sites with 18 teams each for a total of 72 teams. Six will advance from each site to the NCAA Golf Championship May 17-22 at The Blessings in northwest Arkansas. OSU went into the Big 12 Championship ranked 67th by GolfStat and 62nd by Golfweek, but some of the regional spots go to conference champions who will not be ranked in the top 72. Depending on how things play out, there should be about 55 at-large spots to be awarded. The Cowgirls battled strong south winds, fast greens and firm fairways to get around the course in 21-over 309 Monday. It doesn’t sound impressive, but it was the second best score among the nine schools competing, trailing only the 297 by leader Texas. OSU is third at 609, three shots behind Baylor. Texas is running away with the event at 584, but a strong second-place finish on a tough course may be enough to help the Cowgirls extend their streak. The Cowgirls experienced a miserable fall season and were ranked 87th at its conclusion. The additions of three players at semester break strengthened the team considerably. Through 36 holes, the Cowgirls have three players in the top 10, with Lianna Bailey tied for fifth (72-78) and Han-Hsuan Yu (72-79) and Michelle Forsland (77-74) tied for 10th. “They know. We’ve talked about it,” Jones said. “You just have to out and do your best and focus on your golf. You can’t let any of that other stuff distract you. The Oklahoma Sooners shot 314 Tuesday and moved up a spot into fifth at 615. Libby Winans is tied for third individually at 149 (72-77), while Kaitlin Milligan of Norman is tied for 17th (75-79) despite a struggle with her short iron play Monday. OU is ranked 18th and will be hosting one of the four NCAA Regionals May 6-8 at Jimmie Austin OU Golf Course. The Sooners are in no danger of missing the field, but would like to close strong Tuesday to get prepared for regional action. Regional assignments are handed out April 24. Live scoring is available at www.golfstat.com. ← Will Woods’ historic win benefit the game at grass roots level?